Welcome to RoboWorks! Help design machines to solve some real-world problems. The goal of Challenge: Robots! is to expose students to exciting careers in engineering, focused specifically on the area of robotics. It is a browser-based game that challenges students to take on the role of an engineer at RoboWorks, a robotics factory. Students undergo orientation and training exercises in the form of fun, self-directed challenges. Through these engaging and fast-paced activities, students learn important concepts about the engineering process (a series of steps that engineering teams use to guide them as they solve problems), as well as the main parts of a robot, how those parts change with the problem the robot is intended to solve, and basic robotics programming. After the two-part orientation, three challenges are available, and players in the role of new RoboWorks engineers can explore them in any order. Each challenge focuses on designing a robot to solve a real-world problem—on land, sea, or in the air. These challenges are all based on real robots that are used today. 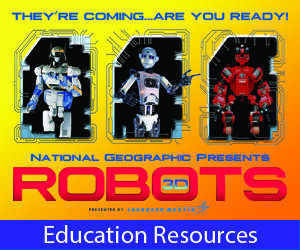 Use this educator guide to engage students in Grades 3-10 with Challenge: Robots! game in a variety of settings, both in and out of the classroom.